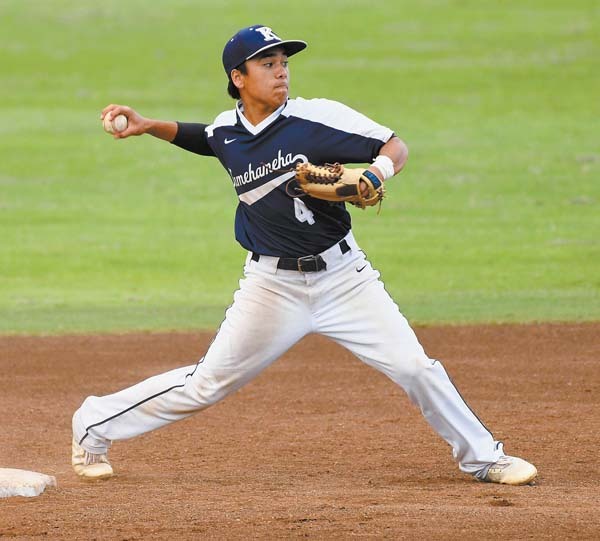 WAILUKU — Konnor Palmeira hadn’t batted leadoff in his life before the last two games for his Kamehameha Schools Maui baseball team. 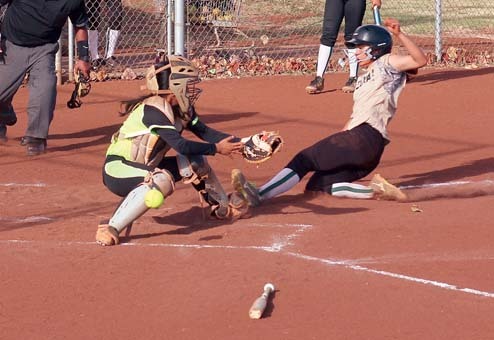 The strategy worked as Palmeira drove in both runs in the Warriors’ 2-0 win over Maui High in a Maui Interscholastic League Division I game on Thursday afternoon at Maehara Stadium. The Warriors improved to 4-0 in the MIL, while the Sabers were making their league debut. Palmeira doubled to start the game and was stranded at third base in the first inning, singled in Dana Bui with the first run of the game in the third inning and walked with the bases loaded in the fourth to push the lead to 2-0. Warriors starting pitcher Dylan Almeida delivers in the second inning on his way to throwing a complete-game shutout. He popped out to the catcher in the seventh, but his offense was enough for the win behind the pitching of sophomore Dylan Almeida, who struck out five and walked one in a complete-game five-hitter. The Warriors were solid defensively, committing no errors and turning double plays in the fifth and seventh innings. Maui High’s Taelen Bates pitched six solid innings for the Sabers, allowing three hits while striking out four and walking five. 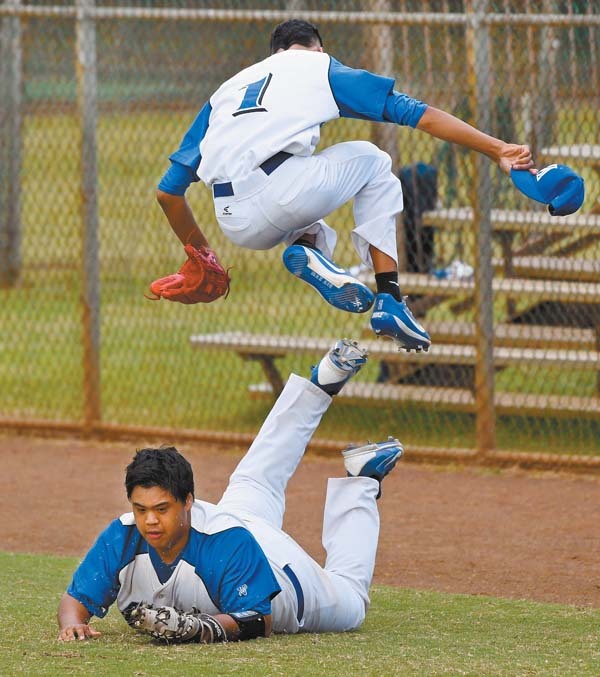 Maui High pitcher Taelen Bates leaps over first baseman Kamahao Ching after Ching made a diving catch on a pop fly to end the top of the third inning Thursday. If the Warriors keep playing like they are, Palmeira says they can make a statement at the state tournament at Maehara Stadium May 8-11. Kamehameha Maui coach Mo Lau Hee would like to see more hits. Lau Hee was happy to see Almeida, his young right-hander, put up a second straight impressive performance on the mound as the Warriors’ No. 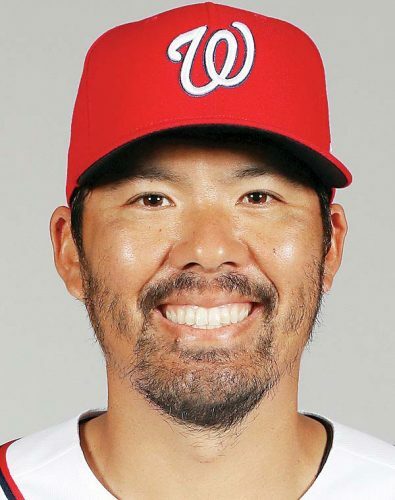 1 starting pitcher. 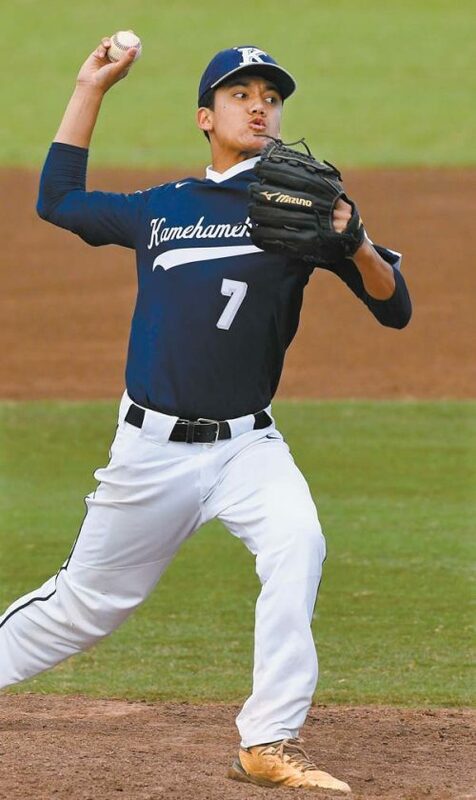 He allowed one run and three hits in a complete-game, 3-1 win over King Kekaulike last week. Kamehameha Maui second baseman Tai Kauhaa-Po turns a seventh-inning double play. 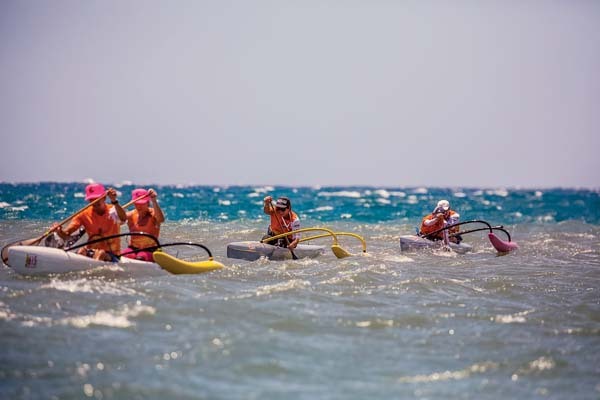 Maui High coach Chase Corniel knows that to stay in the 12-game regular-season race, wins are a must from the very beginning. Dylan Almeida and Ross Panlasigui; Taelen Bates, Dylan Kokubun (7) and Keelan Yagi. W–Almeida (2-0). L–Bates (0-1). 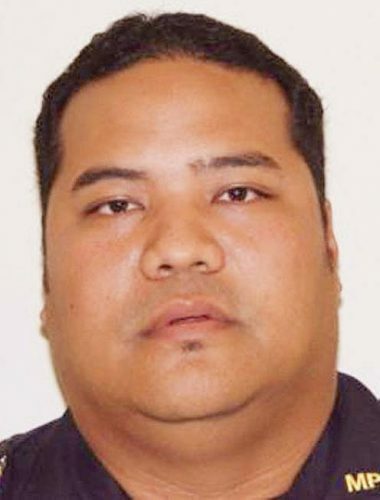 2B–Kamehameha Maui: Konnor Palmeira. Leading hitters–Kamehameha Maui: Palmeira 2-3, 2 RBIs. Maui High: Tyrell Ruiz 2-3. Kamahao Acpal, Anthony Felice (3), Ekolu Mathias (5) and Kealaula Medeiros. Matthew Hackett, Noah Sumibcay (4), T.J. Perkett (5) and Mikey Beesing. W–Felice. L–Hackett. 2B–Lahainaluna: Mathias, Nephi Hong; King Kekaulike: Gavin Grossman. Leading hitters–Lahainaluna: Mathias 2-3, 3 runs, RBI; Kalewa Kalanikau 2-4, 2 runs; Acpal 2-3, 2 runs, 2 RBIs; James Smythe 2-3, 4 RBIs. 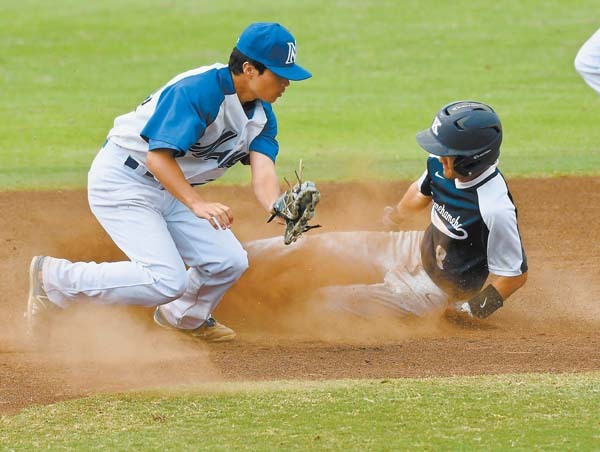 Lanai at Molokai, 3:30 p.m.
St. Anthony vs. Hana at Maui High, 3:30 p.m.
King Kekaulike vs. Lahainaluna at Maehara Stadium, 3:30 p.m.
Maui High vs. Kamehameha Maui at Maehara Stadium, 4:30 p.m.